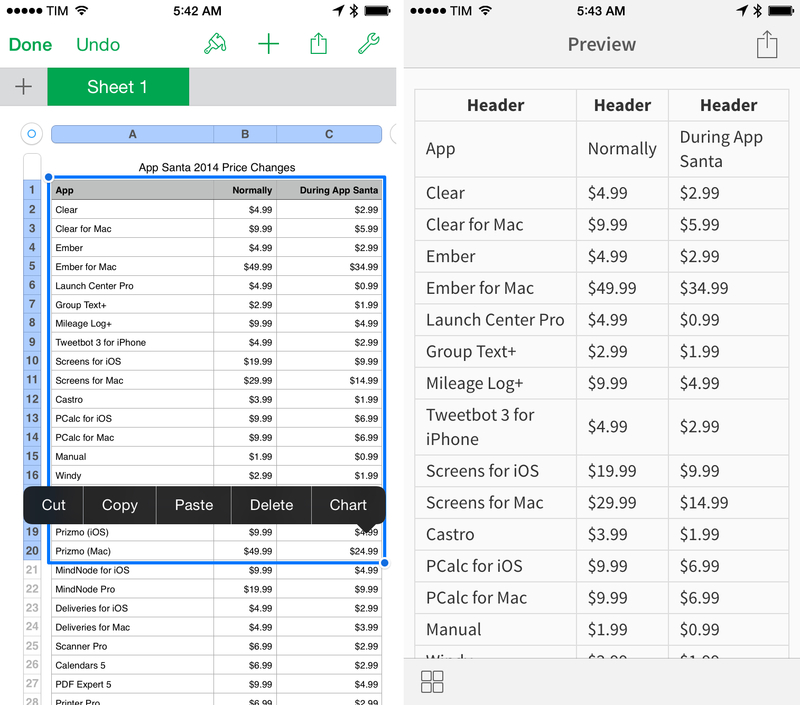 Going from a spreadsheet to a MultiMarkdown table with a workflow on iOS. This is a proof of concept that I put together out of curiosity today, and it'll likely break for some documents or Microsoft Excel, but it's been working well for me, and I thought I'd share it. I created a workflow that converts colums/rows copied from spreadsheets in Numbers and Google Sheets to a MultiMarkdown table. I never understood how to write MultiMarkdown tables manually, and I prefer the experience of apps like Numbers and Sheets, which allow me to easily navigate between cells, modify text that's already been entered, and copy selections with the tap of a button. However, all my writing is done in Markdown, and I didn't have an easy way to convert the output of Numbers and Sheets into text that could be understood by Editorial and processed to HTML for MacStories. So, I wrote a workflow that converts text copied from a spreadsheet to a Markdown table that Editorial (and other apps like Byword) can preview and convert to HTML. 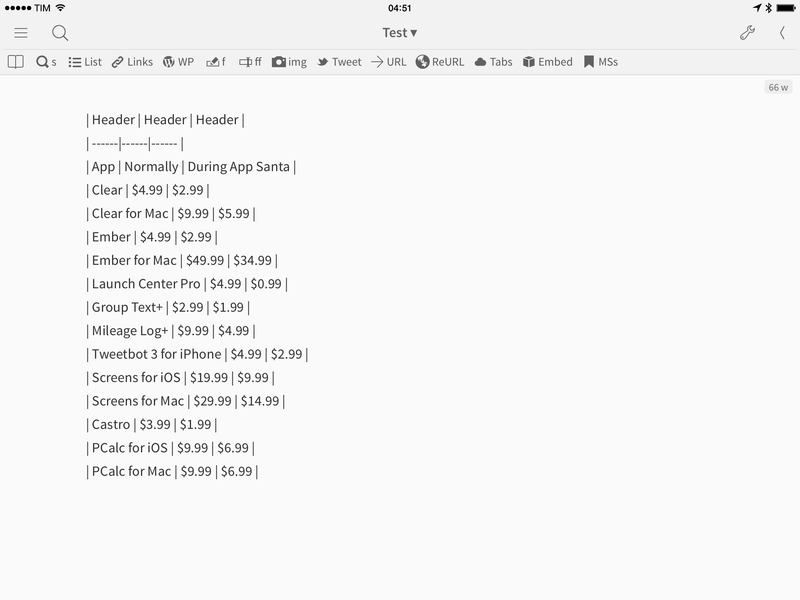 Paste the result in apps that can preview Markdown tables (like Editorial) and preview the table. Because the syntax for MultiMarkdown tables is heavily based on the pipe character ( | ), spreadsheets that contain it may have issues with the workflow. The workflow has been working beautifully for the “basic” spreadsheets I have: I can now copy text, run the workflow, and end up with a fully assembled MultiMarkdown table that I can paste in Editorial. All I need to do is change the “Header” placeholder with what I want – I could have used the first row of a spreadsheet for the headers' names, but I figured it'd be better to change the final output manually. 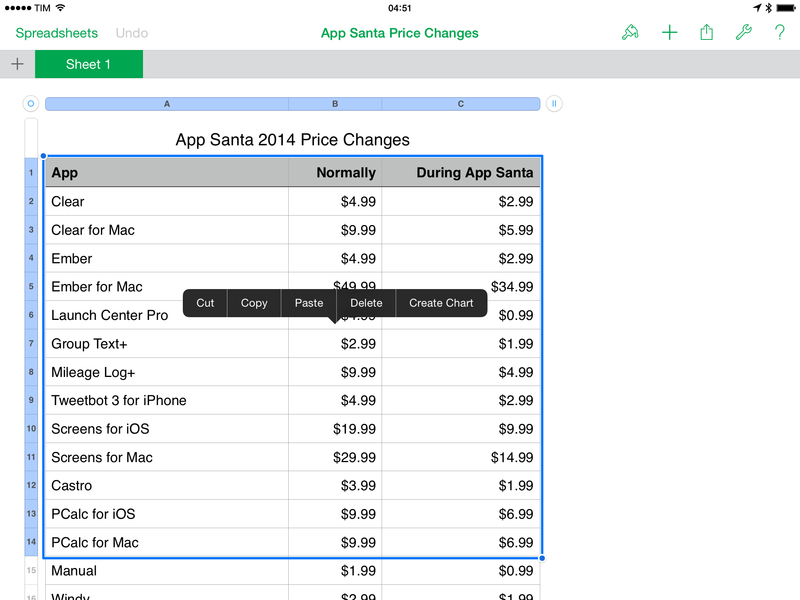 I'm excited about the possibility of turning Google Sheets documents (which I'm using with Zapier quite a bit) into tables I can put on MacStories without leaving my iPad or writing a complex Python script for the task. You can download the workflow here. If you have improvements/suggestions, I'd love to hear from you.